Welcome to A Southern Comfort - Ask About Our Military Discount! 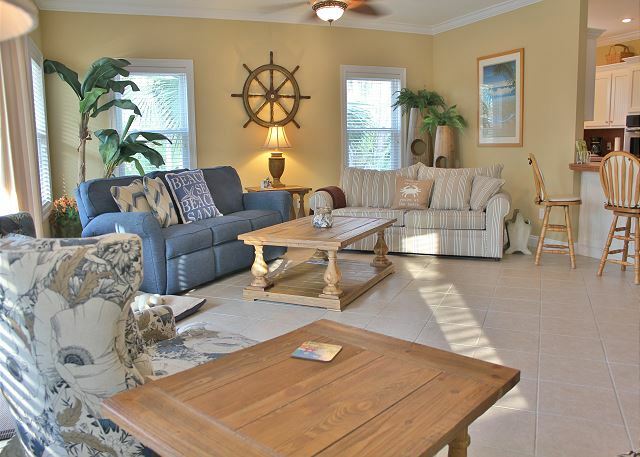 This upscale & comfy home, situated between the beaches of Cape San Blas & Indian Pass, lives up to its name as an immaculate home, yet offers our guests a relaxed & comfortable stay. Within a short walking distance to our beautiful pet-friendly beaches, A Southern Comfort offers the captivating experience of our magical seaside lifestyle. 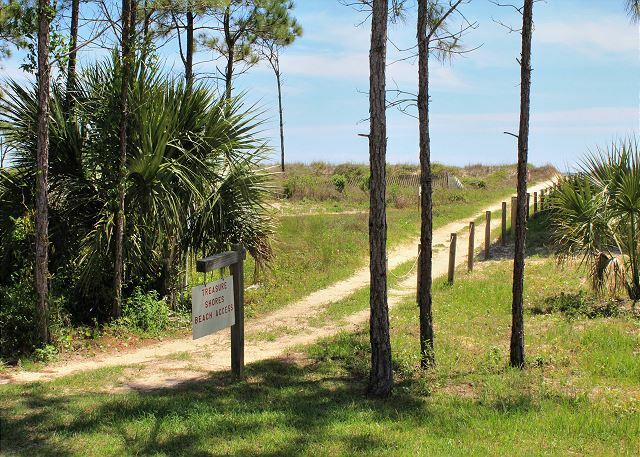 Just across the street and down the community pathway is the beach access - it is also golf cart friendly. 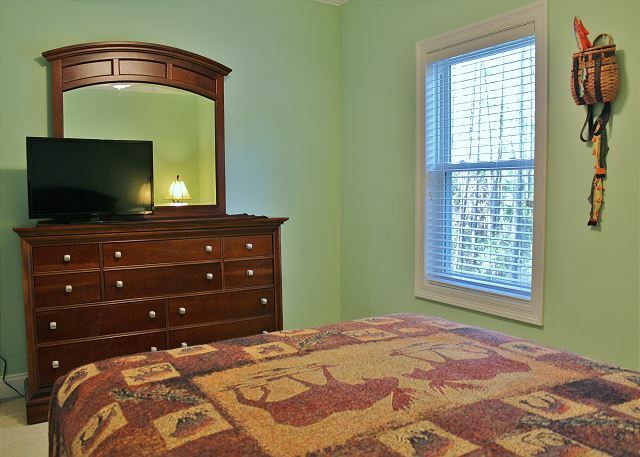 With upscale amenities & well-kept accommodations, your stay at this delightful home will be a memorable one. Don't forget you're also close to the world famous Indian Pass Raw Bar! 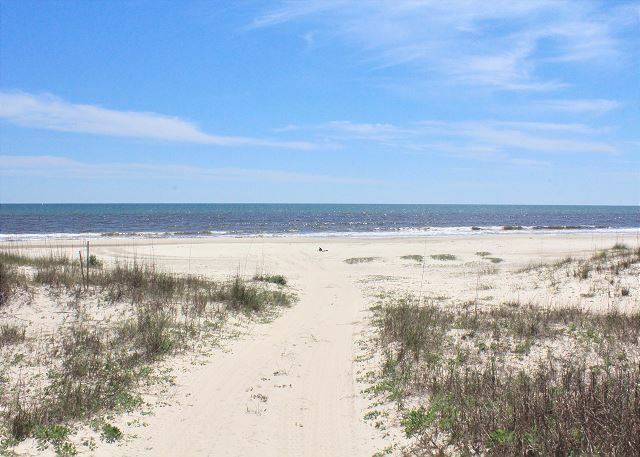 Weekly family vacations, monthly couple’s retreat, & weekend anglers looking to explore our coastal waters will enjoy staying at A Southern Comfort. Plus, with A Southern Comfort being a pet-friendly home, it offers your pet excellent accommodations that your four legged companion will enjoy - including a fenced dog run. A Southern Comfort has a spacious driveway & parking underneath the house; perfect for parking your boat & car. A fish cleaning station and an outdoor shower with hot and cold water has been added. Stairs lead up to the first level, but elevator access from ground level is a convenient alternative that takes you all the way to the master suite. The spacious open deck is an ideal spot for outside entertaining, and takes you to the front entrance of the home. The first level welcomes visitors to the living, dining, & kitchen area. 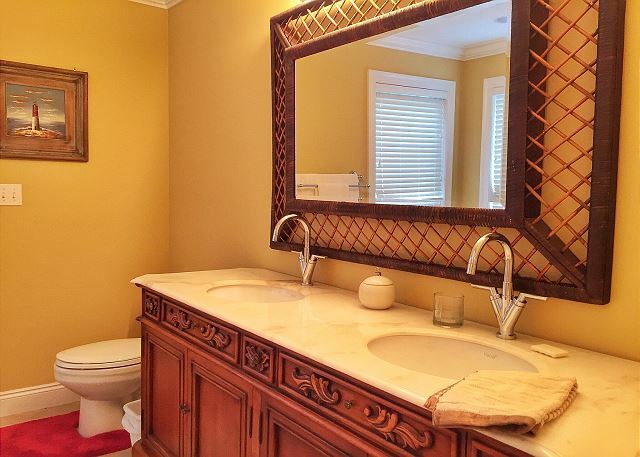 The living room is tastefully decorated, and tile flooring is laid throughout the entire home. Guests will be delighted with comfortable sitting and large 55” Smart TV. The dining room is elegant & sophisticated, yet comfortable and fun to entertain and dine in. The kitchen is right across from the dining room, and is equipped with stainless steel appliances. You’ll enjoy preparing your meals in this kitchen, so be sure to stop by some of our local seafood markets to purchase fresh local seafood. A screened porch off the dining room is an added bonus. The two guest bedrooms are located on the first floor. 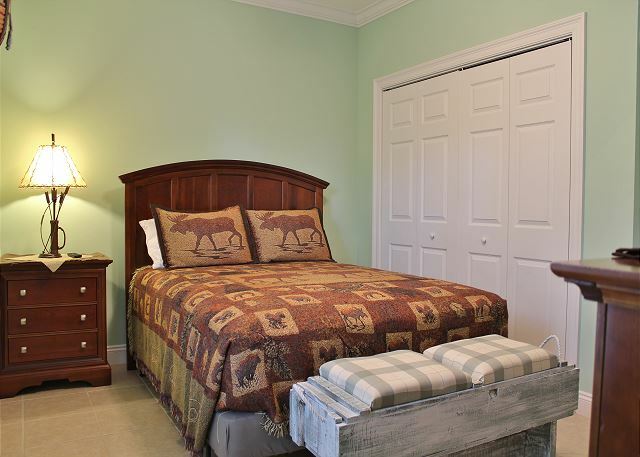 Each room has a comfy queen size bed, and a full size bathroom stands between the two. 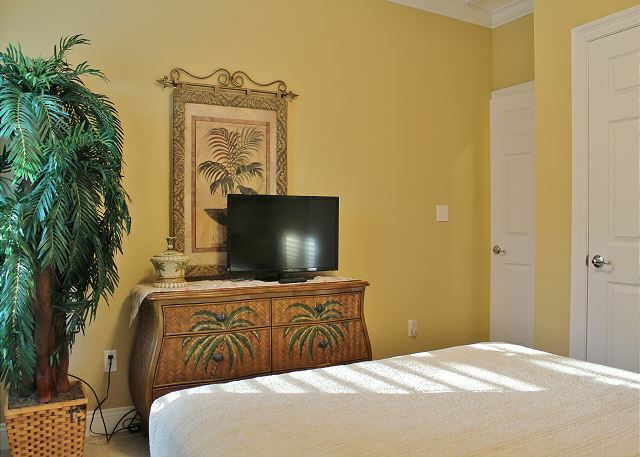 Each room has its own personal décor, and TVs for each room adds another benefit for guests. The entire second level is dedicated to the master bedroom. 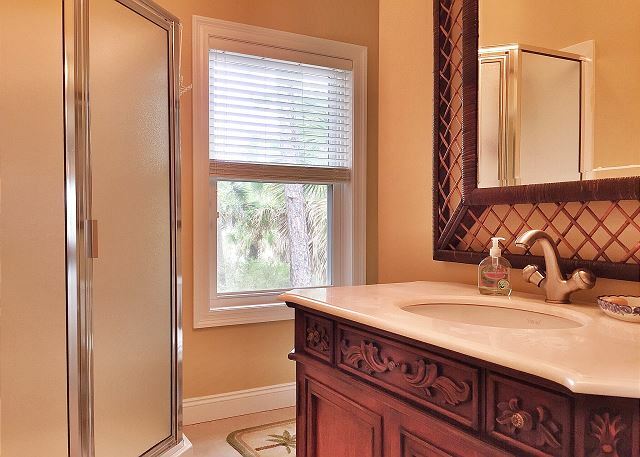 This private suite offers your own private deck, stunning master bathroom, and a comfortable king size bed. A walk-in closet and a large TV completes this already exquisite space.